Basler Flight Service announced today that it will become a dealer for Shell aviation products through a new dealership agreement signed with Eastern Aviation Fuels of New Bern, North Carolina. The agreement includes an investment of more than $750 thousand to expand and realign the Basler hanger, fuel storage and office facilities on the north side of Wittman Airport. Basler Flight Service originated at Wittman when Warren and Pat Basler bought the operation from Steve Wittman in 1957 and has spawned several other aviation businesses including particularly Basler Airlines and the current parent, Basler Turbo Conversions. Pat and Warren were joined in 1996 by Jack Goodale, our current owner. The Basler Flight Service office will be relocated to the Wittman terminal building on the north east side of the field in the near future. Shell product sales will begin May 1st and will include the full line of Shell fuels and lubricants as well as Shell contract fuel. Contact information will continue to be found on Basler’s AirNav listing. Proving He's No Enemy of Ours! 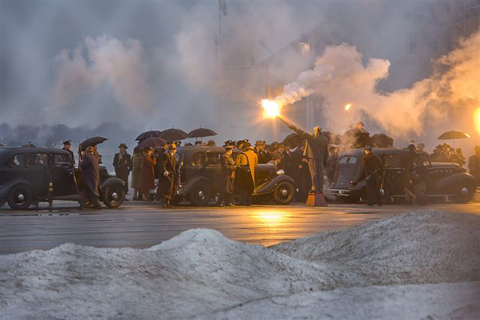 The Basler hangar experienced extensive set design over a five day period to complete the transition back to the 1930's. Filming began on April 11th on a closed set, and continued late into the night before the crew successfully completed the scenes. 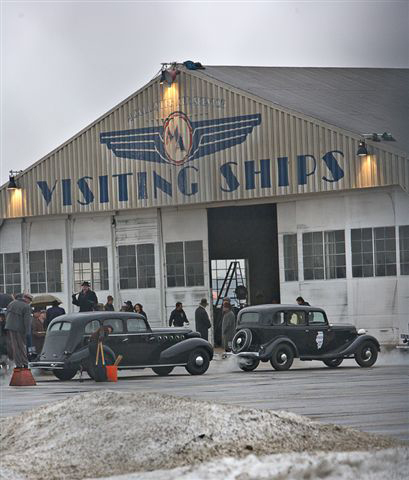 Crews from Universal Pictures spent part of April in Oshkosh, Wisconsin and surrounding rural areas filming pivotal scenes for the movie. The release date has yet to be disclosed. More information will be provided as it is released by the studio. May 25, 2006, Oshkosh, Wis. -- Basler Flight Service, FBO at Wittman Airport in Oshkosh since 1957, announced today that the Wisconsin Supreme Court ruled in its favor that Wisconsin’s minimum mark up law does not apply to aviation fuel. The ruling brings to a close a three year legal battle brought against Basler by Oshkosh competitor Orion Flight Services following Orion’s initial attempt to under price Basler on fuel sales. Orion opened for business at Wittman in 2002 following brief appearances by several other FBO’s there during the 1980’s and 1990’s. Basler Flight Service President, Rod McNeil, said “We’re obviously pleased with this ruling. It’s been a long and expensive process to prove that aviation fuel is really a different product in a different market from automotive fuel.” The court ruled that the minimum mark up provisions, which require that motor vehicle fuel prices must include a profit of up to 9.18%, do not apply to aviation fuel sold in Wisconsin. This is a victory for the entire aviation industry. The Wisconsin law also allows for “private cause of action” (one competitor making a penalty claim directly against another), providing penalties of up to $2,000.00 per day of assessed violation plus attorneys fees. “It’s even conceivable that a claim could be made on an FBO at another airport under this provision” Mr. McNeil said. The ruling also and importantly exempts fuel purchases by airlines who tend to purchase fuel under long term supply contracts in order to stabilize and minimize their fuel prices. Midwest Airlines and Wisconsin Aviation Trades Association joined Basler’s defense with supporting briefs, underscoring the importance of this case to the aviation industry. June 23, 2004, Oshkosh, Wis. -- As they did in 2003, Basler Flight Service donated 500 gallons of 100LL aviation fuel to the EAA’s B-17, a WWII warbird that visitors and locals alike will see flying the daily airshows starting today.The certificate for fuel was presented to EAA President Tom Poberezny, and EAA Museum Director Adam Smith on Friday, July 23 at the EAA Foundation Hangar. On hand for Basler Flight Service were Mary Garcia, General Manager, Brian McBryde, Line Service Manager, and Tom Weigt, President of Basler Turbo Conversions, LLC. 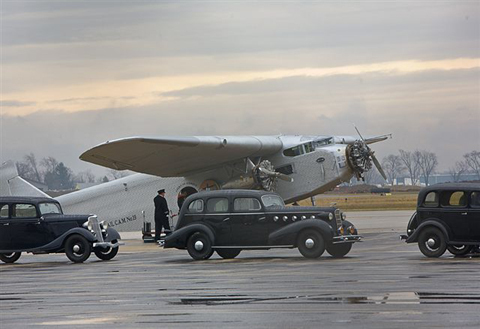 The long-standing relationship between Basler and EAA goes back to EAA’s first fly-in at Oshkosh. This second annual fuel donation is just another chance for Basler to show its appreciation to the EAA organization and its many members. “The B-17 program is a worthwhile cause and we are happy to give something back to the aviation enthusiasts who come here each year. We hope that it is a safe and successful week for everyone involved,” Ms. Garcia said. 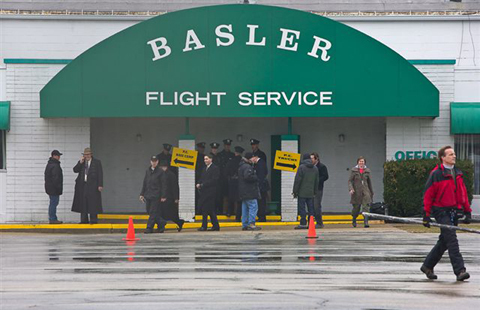 Basler Flight Service has been a fixed base operator (FBO) at Oshkosh since 1957. They provide fuel, parking, and other customer services to aircraft flying in and out of Wittman Regional Airport year-round. The company also operates an on-demand cargo charter airline. October 4, 2003, Oshkosh, Wis. – The successful partnership of EAA Young Eagles Chapter 252, local aircraft owners and pilots, and Basler Flight Service has brought EAA 75 children closer to their goal of 1,000,000 first-time fliers. The event, held Saturday, October 4 at Basler Flight Service, brought out parents with their eager children ages 7 – 18 years. The four hour fly-in was free of charge. The following aircraft owners and pilots donated their time and knowledge to teaching local children about aviation and flying: Don Jones, owner of a passenger configured DC-3 piloted by Paul Votava and Kevin Lemke; Pastor Boyte, owner and pilot of a Mooney; Mark Beckhum, owner and pilot of a Long Easy; Brian Rippe, owner and pilot of a Cessna; and Frank Freidman, owner and pilot of a Beechcraft. The four single-engine aircraft and the twin-engine DC-3 flew patterns north and south of Oshkosh, causing many children to excitedly search for landmarks that they are familiar with, but had never seen from the air. The rides lasted approximately 15 minutes. Pilots educated their students in the processes of a preflight aircraft check, airport tower communication, take-off and landing. Numerous volunteers and Basler Flight Service employees made sure that things on the ground went smoothly. At the end of the day, 75 children received their Young Eagles certificates and will go on to have their names entered in EAA’s “World’s Largest Logbook,” a record of Young Eagles and their pilots, which can be viewed online at www.eaa.org. EAA’s goal is to reach 1,000,000 Young Eagles by December 17, 2003. Currently, over 975,000 children have been certified.